Perfumed notes of blackberry, mixed spice, licorice, confectionery and roasted meats characterise this Deer In The Headlights Barossa Valley Shiraz, 2004, from the Two Hands winery. 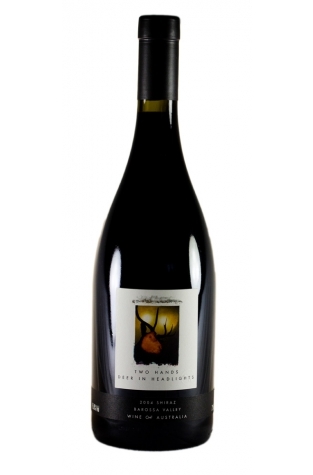 The palate shows great depth and weight with a solid core of blackberry, ripe plum and hints of black pepper flavours. The bright tannin remains focused and in balance against the fruit profile. The 'Two Hands' are Michael Twelftree and Richard Mintz who formed the company in 1999 with the clear objective of making the best possible Shiraz based wines from the prized Shiraz producing regions of Australia. The Deer in Headlights Shiraz is bottled each year from a very small selection of barrels from the western district of Barossa that defines the intensity and richness of this sub-region.